Firstly I have extended the 15% OFF EVERYTHING SALE throughout the Half Term Week at www.pastposters.com (not available on eBay purchases) as a number of you informed me you were away for the Bank Holiday Weekend and missed out, So grab those watched items before someone else does!, plus the Lobby Card Sets from last weeks auction have also been added to the site and so they are also included in the discount! (click the recent additions link or lobby card link on the homepage to easily find them). SALE Must End Sunday 31st May 2015. For this weeks eBay auction I have listed nearly 90 Original British Quad Posters, half of which are from the last couple of years and the other half are early to mid 1990’s. 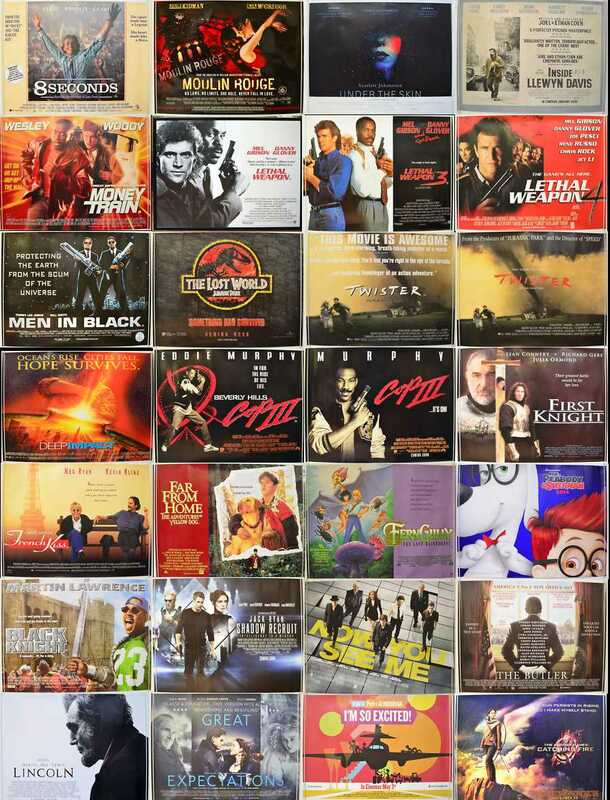 Great titles including posters for three of the “LETHAL WEAPON” movies, two differing posters for “TWISTER”, plus “MEN IN BLACK”, “BEVERLY HILLS COP III”, “JURASSIC PARK : THE LOST WORLD”, “MOULIN ROUGE” and Sean Conner starring along Richard Gere in “FIRST KNIGHT”. More recent fare includes “UNDER THE SKIN” starring Scarlett Johansson, Award Winning “LINCOLN”, and “THE BUTLER”, plus part two in the HUNGER GAMES series “CATCHING FIRE”.